Ethan Fisher was playing with his Silly Bandz, rubber-band bracelets that have become the latest trend with kids, when he saw a paperclip and started bending it into different shapes, similar to the Silly Bandz. That's when the idea hit him: "Why not wear them," he said. 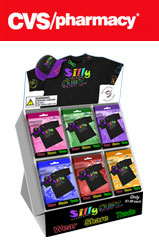 Hence the birth of Silly Clipz, which are essentially paperclips that come in unique shapes and colors and can be worn on clothing. The 8-year-old Delray Beach resident, with the help of his parents, Justin and Claudia, had about 115 clips manufactured this summer when Ethan tested out the idea with his friends. He was on a camping trip with them and left out a box of the clips, and to his surprise and excitement, his friends couldn't get enough of them. Since then, he and his parents have managed to get the product into a few local stores, including the Hallmark in the Boca Raton Town Center mall. The clips are also sold on his website, sillyclipz.com. "The idea just exploded," Ethan said. "The response that we continue to receive is super positive." Although Silly Bandz have been banned at many schools, including Omni Middle School in Boca Raton, Ethan said that Silly Clipz shouldn't have that problem because they can be used as paper clips. Ethan's parents are enjoying the entrepreneurial adventure just as much as their son, and can be found wearing the clips every day. "It has brought us closer together as a family," Justin Fisher said. Ethan, who is homeschooled, has been able to incorporate his business into his studies, and he said that it has been an incredible learning experience for him. "I'm learning about a lot of key things that will help me in life like marketing and merchandising," he said. He has enjoyed the experience so much so that he said he would like to be entrepreneur when he grows up. "I never thought at 8 years old I'd be able to do this," he said.